Entrepreneurship is like recognizing a need and starting a business to fill that void. 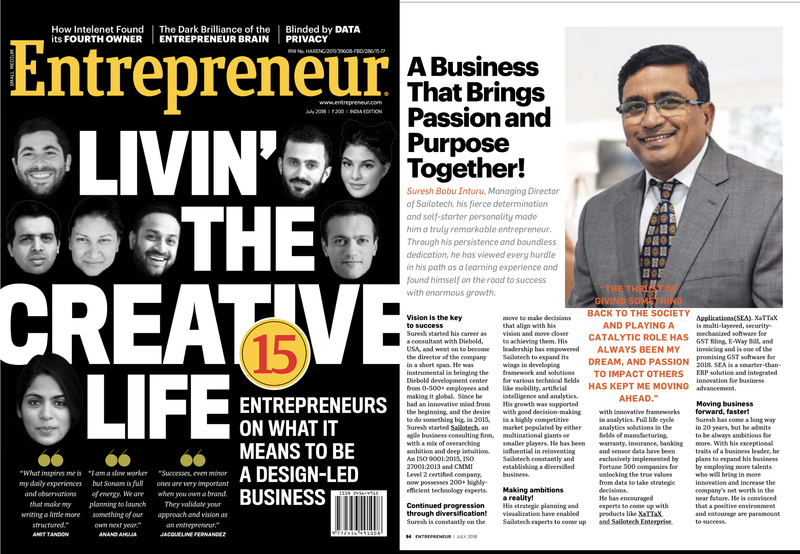 Mr. Suresh Babu Inturu has set an example of being an perfect entrepreneur by showing his persistent progression towards innovative solution to a key problem. Achieving success within a short span of time, he talks about his ability to recognize the bigger picture, find where there’s an opportunity to make someone’s life better, design hypotheses around these opportunities, and continually work for the satisfaction of the customers. Being featured in SiliconIndia and ranked under the top 20 most promising GST software providers -2018, Mr. Suresh, plans to expand his business by employing promising talents who will bring innovation and help Sailotech reach roaring success.